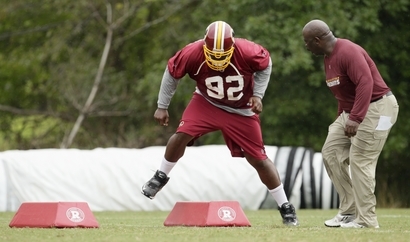 You knew this would be coming, as the Washington Post reports that the Redskins are starting to get a little fed up with the issues surrounding Albert Haynesworth, who has yet to pass his conditioning test and hasn’t practiced once since training camp has started. On Day 9 of the Albert Haynesworth watch, frustration is mounting within the Redskins organization because the Pro Bowl defensive lineman still has not passed the conditioning test he must to participate in full practice, multiple people familiar with the situation said Friday morning. 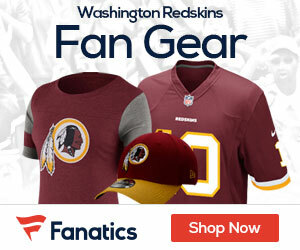 An MRI exam Thursday of Haynesworth’s sore knee revealed no structural damage, and the feeling among many at Redskins Park is that the two-time all-pro should have already passed the test. Although perplexed team officials acknowledge Haynesworth probably is experiencing knee irritation, sources say, they do not believe his pain rises to a level that would prevent him from passing the test of two, timed 300-yard shuttle runs. 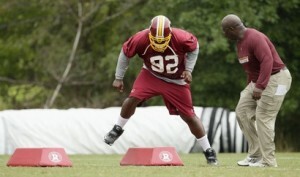 Moreover, Haynesworth has not even attempted the test since Monday, and his last strong effort occurred July 30. The nine-year veteran’s decision to delay retesting is unsettling to the Redskins, especially in light of the encouraging MRI exam and Thursday’s performance on a treadmill in which “he was flying,” one source said.